Anyone who knows me knows that a) I LOVE this time of year and b) I am a Starbucks gal through and through. As soon as October rolls around, it's all about Pumpkin Spice Lattes and when November begins, I'm rarely seen without a Gingerbread Latte in my hand. Ok, that's a slight exaggeration but I do have an obsession with Starbucks' red cups. 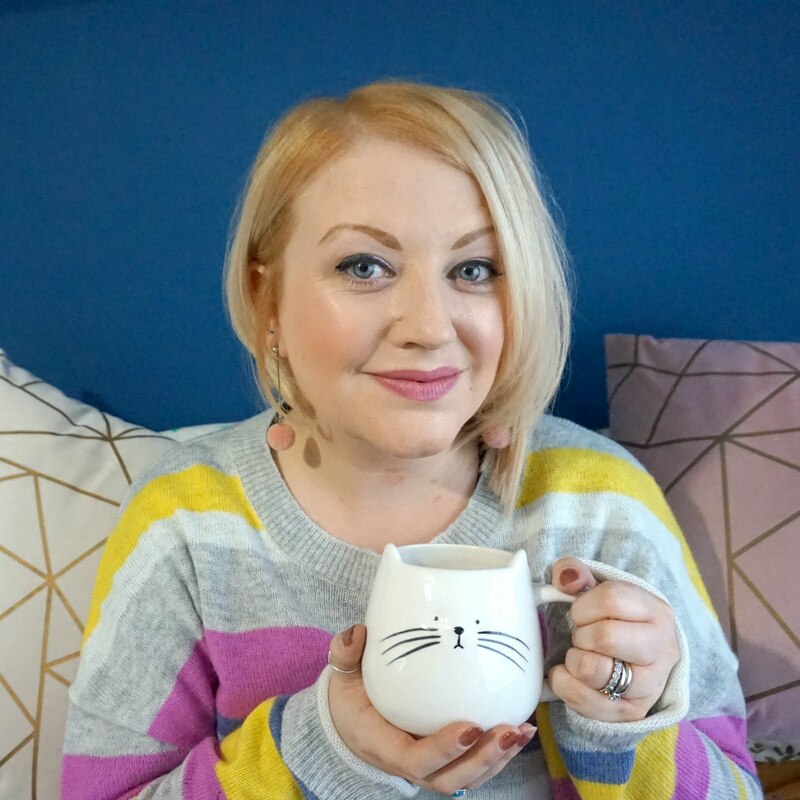 My Starbucks obsession continues at home where I like to treat myself now and then to one of their syrups to jazz up my cuppa and I have quite an impressive collection of mugs too from places I (and my friends) have visited. So, when I was given the chance to exclusively sample the all-new flavour for Christmas 2014, along with some of the festive foods that will also be on offer soon, how I couldn't resist? 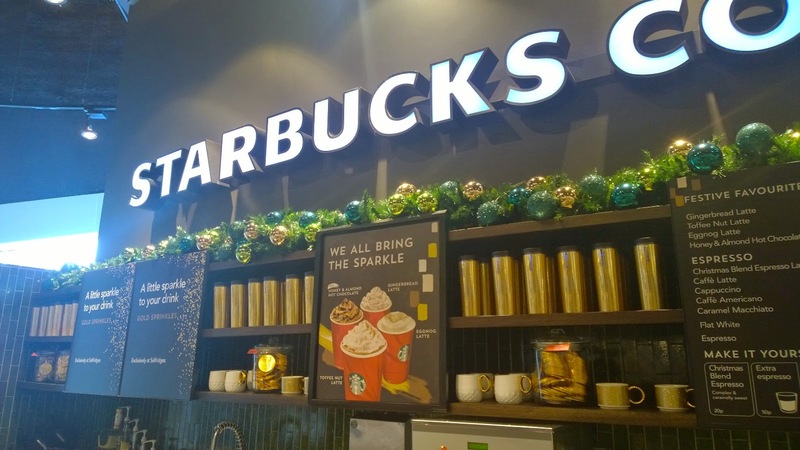 I popped along to the Starbucks in Selfridges, Bullring, which had been treated to a festive makeover, with garlands, baubles and a touch of gold glimmer too. 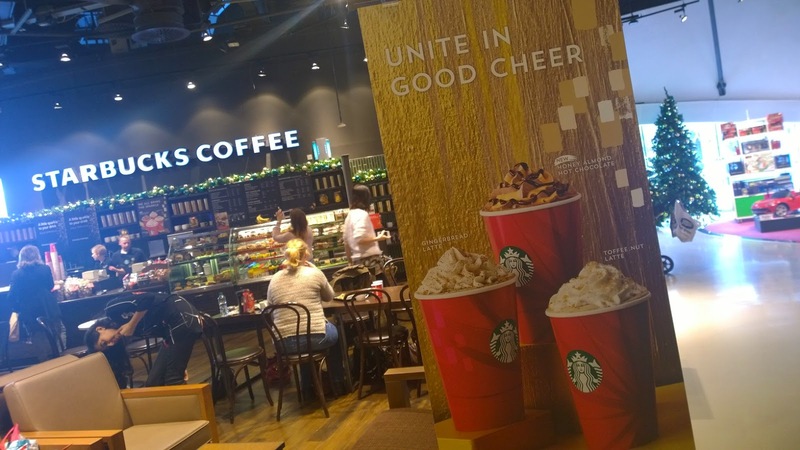 The Starbucks team had laid out a selection of their festive fayre for us to try and unveiled the new red cup flavour - honey and almond hot chocolate. Wow. 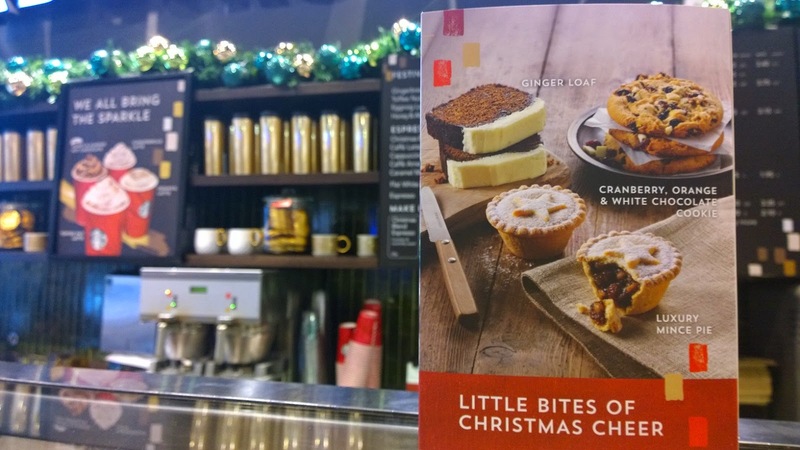 We tried their signature Christmas Blend coffee whilst nibbling on a delicious ginger loaf and a yummy cranberry, orange and white chocolate cookie before getting our mitts onto the new red cup flavour. 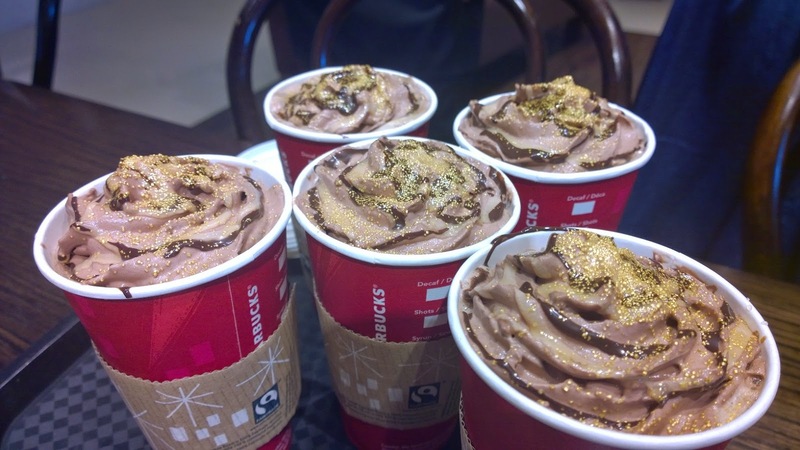 Presented with a sprinkle of special gold sugar on top - a signature addition for Selfridges Starbucks only this season - the honey and almond hot chocolate looked as good as it tasted. Certainly one for those with a sweet tooth, the new red cup puts an extra special twist on hot chocolate and I'll definitely enjoy one or two more of these before the end of the year. 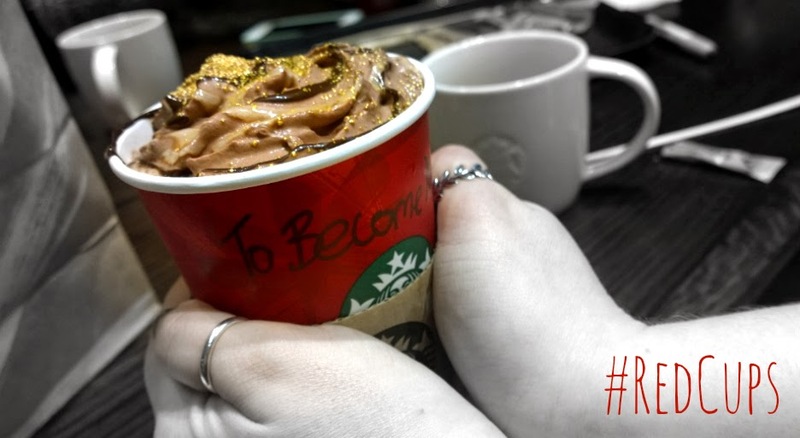 The classic red cup trio of Gingerbread Latte, Toffee Nut Latte and Eggnog Latte will be back in Starbucks nationwide from 4th November - hurray - so make sure you get in on the #redcups action and share your snaps on Instagram and Twitter. 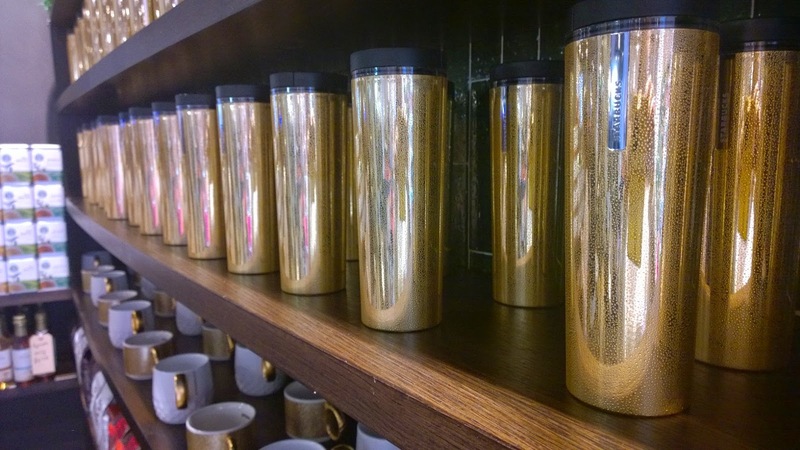 There's also some gold signature mugs and travel mugs available, again exclusively to Selfridges Starbucks, which will add a touch of glamour to your coffee break for sure. 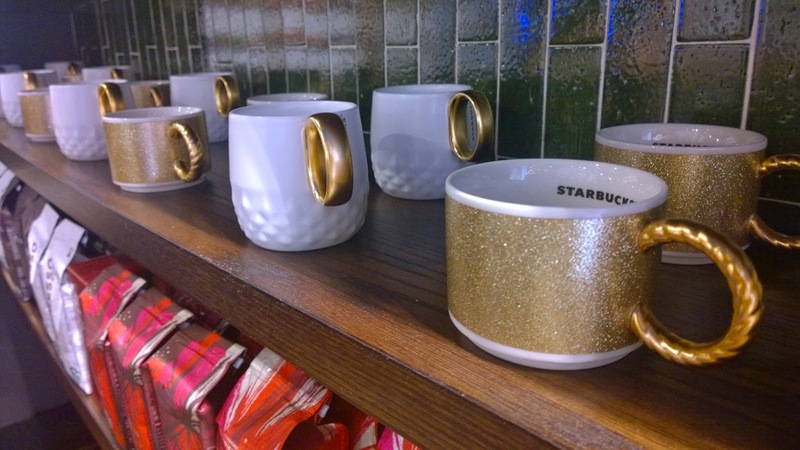 You can even get a golden cup holder sleeve for your coffee takeouts - how festive is that? I like to embrace everything that reminds me of Christmas and I know that when the red cups arrive, the festive season is almost upon us. I'll drink to that. I don't drink coffee much but I love the sound of the almond hot chocolate - anything with cranberries is good too.